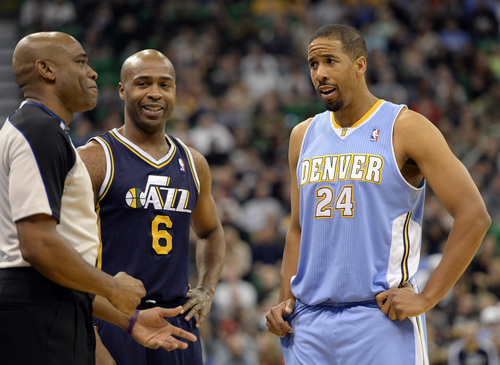 Rick Egan | The Salt Lake Tribune Utah Jazz point guard Jamaal Tinsley (6) and Denver Nuggets point guard Andre Miller (24) talk with referee Tre Maddox (73) in NBA action, Utah vs. The Denver Nuggets, in Salt Lake City, Monday, November 11, 2013. The Jazz waived veteran point guard Jamaal Tinsley on Tuesday, after just eight games back with the team. Tinsley, 35, was a late signing for Utah after rookie point guard Trey Burke broke his right index finger during training camp. He played in eight games, averaging 1.1 points and 2.9 assists in 14 minutes a night. Tinsley had played the previous two seasons in Utah. The Jazz roster now stands at 14 players. Burke, meanwhile, is not yet cleared to fully practice. Doctors this week said the rookie could begin solo basketball drills. He will be re-evaluated Nov. 25.